On Friday, November 18, 2011, Hawthorn School history was made as the first public performance of the new school song took place in the atrium of the school. Proud parents listened to their daughters sing with school pride. 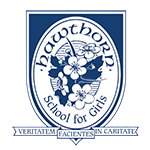 Developing a Hawthorn Song was an initiative that began during our 20th anniversary celebrations in 2009-2010. The winner of the lyrical contest was Kay Song, mother to Lower School student Natalie Baldocchi. The melody was composed by James Taylor, an accomplished musician who is no stranger to the Hawthorn community – his wife and sisters are Hawthorn alumnae. Today, the school song, Forever in our Hearts, can be heard at every school assembly and has become a lasting symbol of Hawthorn. 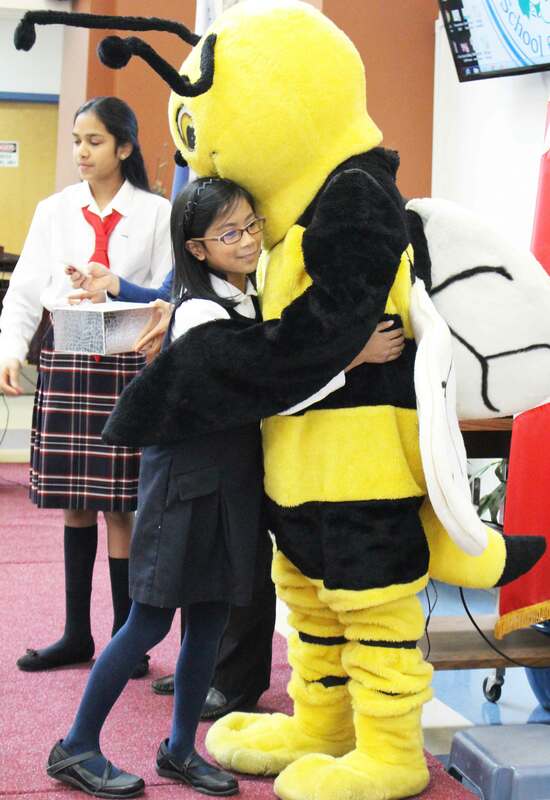 The bee was selected as Hawthorn’s school mascot in 2006 by the Director of Character Education at the time, Miss Johnson. Bees mimic the virtues taught at Hawthorn, such as industriousness, order, spirit of service and generosity, among others. 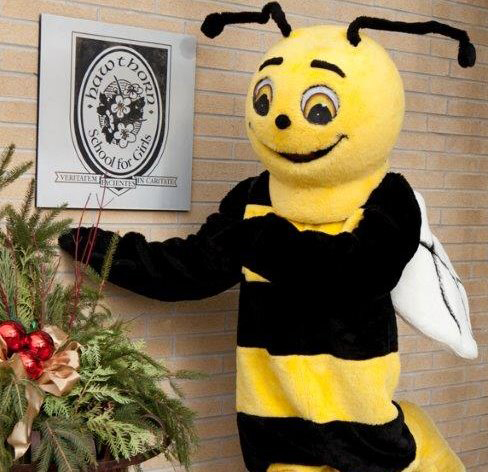 The current bee mascot seen at athletic competitions, school events and assemblies was designed as part of an art contest, by Michaela Lee (class of ’09). Michaela’s original design is pictured above. Today, we hand out “virtue bees” at assemblies to recognize achievement in character development, our sports teams are called the Stingers and in the Spring, real bees can be found buzzing around the Hawthorn tree planted near the front entrance of the school.